I was gone yesterday afternoon on some Mom business and arrived back at the course after the storm had passed through in the early evening. I went down to the lakes to see if I needed to disperse some geese. Yes that time of year to moving the nesting geese along whenever possible. 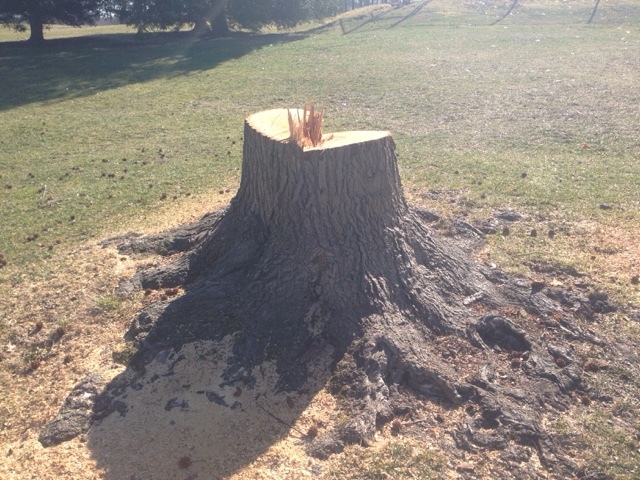 I first saw a smaller splintered limb jammed into the bank next to the fairway nursery between 10/16. I then saw about a 3" in diameter limb jammed into the bottom of the lake and sticking out of the water. As I looked across the lake to #10 I saw the Pin Oak where the lower part of the tree was blown off. As I mentioned to the green committee a couple of times already, this tree is not in good shape due to some damage in the crown area of the tree and is on our watch list. I did mention in an earlier posting that we intend to put a tree just past this tree due to the ultimate demise of this tree in the future. At least the lightning struck an already injured tree. We monitor radar as we see storms approaching. We also monitor the lightning indicator to see the amount of lightning in storms and once the lightning strikes enter the 10 mile zone, we will bring everyone in. As demonstrated from the damage to this tree, being on the golf course during lightning events are not a good idea. I always error on the side of caution and bring staff in quickly because the grass can be mowed a few minutes later. We alert staff and request that they alert members who are out in the same area. That second shot out of the trees can be made 30 minutes later but Your Life cannot be replaced. Please remember that when we call you off the course, sitting underneath trees only makes you a more attractive target. Also, not coming off the course and staff having to chase you down also endangers the life of staff members so when you hear the horn, be forewarned please come inside or go to the field bar if you cannot make it back to the shop for further instructions. 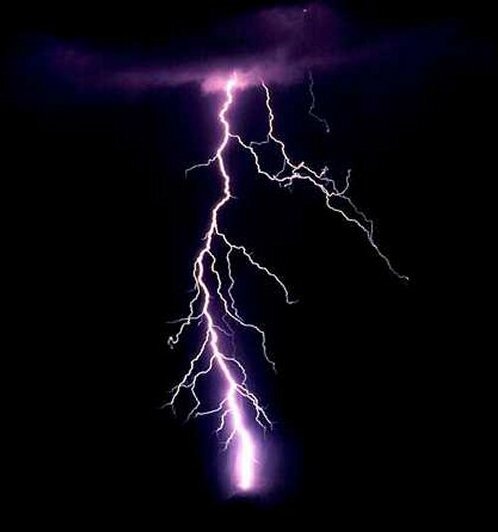 Also, if you've not heard a horn and lightning is close, their is a possibility that staff is not aware of the issue or just became aware of it like you. The safety of our members, guests and staff first and foremost when it comes to protection from storms. The strike on the base of the tree with the shrapnel across the lake on #10. Yesterday was the second aeration completed to our greens in a week's time. We contracted with DryJect of Tennessee to inject sand into our greens. The process involved about 20 tons of sand, 800 buckets full of sand hand loaded into the machine by our staff. The machine uses a 3000 psi bead of water injecting the sand into holes which were over 1/2" in diameter approximately 4" deep spaced about 3"x4". We had 2 units and 8 of us working with the 2 units loading sand into buckets, into the hopper and letting it fly. As the greens began to dry, we brushed them to help smooth the sand out that had been pulled up from last weeks aeration plus excess sand from the work performed yesterday. The process uses water which of course will pull up any existing sand which requires a brushing to smooth back out. We are in growth regulation time which slows the healing process but its still better than a million seed heads which we would be facing if we weren't applying this spray. I think a good trade off in the end, especially since it is very early in the season. We've placed about 60 tons of sand in and on our greens the last 9 days. Over the next seven months, we will be performing at least five venting procedures on the greens involving small needle tines and hydrojecting(water) to help them survive the season. These are very minor in nature and do not create some of the disruption you've seen over the last week. By the way, this past weeks work is absolutely necessary for many of these greens which are over 100 years old to survive the stress of a St. Louis summer. Staff had to keep sand in the hopper continuously. 3-4 bucket fulls per pas on the green. 9th green. A little more sand visible because the unit uses water and as it rolls along, it picked up sand from the surface of last weeks work. After brushing. Still some sand on the surface but we expect that this time of year after aeration. It also helps to smooth out some imperfections this time of year. Most of the new aeration holes are a little difficult to see because the hole is not as large of an opening on the surface as the normal coring tine but explodes out as it entered the sand profile. Alphonso poring sand in the hopper with Chad Gamble, owner of DryJect Tennessee working his way across the green. Finished product with some dyed sand showing the spread and depth. I've been informed that as the water begins to shoot into the surface, sand is vacuumed through the white hose and into the ground. As you can see we are making some great progress. Still have a lot of work to do but the program is working well. I'll get some more shots at the end of April when the 2014 video was taken. I was doing some research on the blog site the other day and ran across the April 2014 video showing some damage or weak areas in 1 Fairway where Bermuda was sprayed the fall before. I did the same thing last fall on this same Fairway but you see hardly any Bermuda damaged from last falls spray because the Zoysia has improved significantly in these areas. That does not mean the Bermuda is completely gone, it probably isn't but it does mean that the Zoysia is more active and out competing the Bermuda in this area. The first video is the current view and the second video is from 2014. I thought you would enjoy seeing the progress, I sure do! Longer Videos from original post. Completed our last 3 greens this morning. Process included mowing, verticutting, pulling cores, picking up almost 2 million cores, applying soil amendment, topdressing, blowing sand in holes, brushing, rolled this morning and fertilized. Video explains most of our work. Being a working member in the aeration process, the video leaves much room for improvement including camera(need to buy a Go-Pro) and maybe a Phantom 3 or 4 drone with some overhead video which will help us in our operation. I placed a link to YouTube for those of you whose devices do not open the embedded videos. Also, we aerated the cool season tees, holes 2,3,5,10,11,14,17 and filled some of the stump grinding holes with soil in preperation for sodding. Short video and a couple pics below as well. Compacted below, pile of soil for me to spread under the watchful eyes of you know who in the background! Smoothed and ready. Might need to add just a bit more dirt but we will see. As we mentioned at last weekends gardening event, Becky is preparing pots for the spring season. She just received a shipment in and I thought I would take a few pictures of the items she is using this season. These plants come in fully grown and ready to plant. You can also include some bulbs and pansies in your pots as well. We usually keep these in place until the end of May, early June depending upon the weather. Some years we hate to pull them out because they are spectacular but you have to get the summer items in. This is one of the many reasons why I am thankful Becky is here because of the work required and the plant selections for the pots. She will do a third transition in these plantings for the fall as well. Mixed Mesculin Lettuce mix for interest and leaf color. Six of us worked till nearly dark this evening aerating our greens. We had a frost delay that slowed us a couple of hours. We were able to get the PG plus 15 others cored, sanded, and brushed. We still need to do some clean up around the greens and finish sanding 16-18 tomorrow morning as well as roll the greens. We also have to apply some granular fertilizer which is chicken manure based and will be a little smelly for a couple of days but will provide great benefit in the future. A more detailed report will follow in the next couple of days. I'm whooped and heading home. Jason coring 14 green on a great day to accomplish this work. The first of our two spring aerations will begin tomorrow, March 21st with a 1/2" core aeration. We expect to have all greens completed by Tuesday if everything goes to plan. We intend to do a second aeration next Monday using a newer technique called Dryject which is gaining popularity around the country. Made a short video for your viewing pleasure of our practice run on the practice green from Friday to make sure our depth was set properly. Over the last few years, there have been questions raised regarding the possibility of having a combination Blue/White Tee since some our events are played at a short blue/long white distance to accommodate all ages and playing abilities. This winter, the golf committee led by Head Pro Matt T made the decision to implement the new tee that will play a distance between the white and blue yardage. The MAGA was contacted and rated the new teeing ground as well for us. 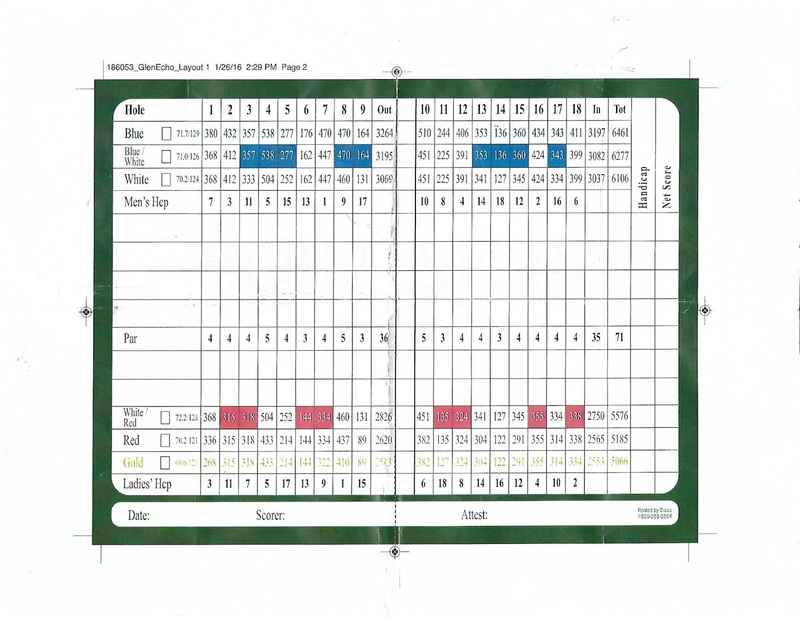 Instead of adding another complete set of tees, it was decided to have a checkered blue/white tee set up for each hole. On 9 holes, the combination tee will be with the blue marker and on other 9 holes it will be with the white marker. A new scorecard has been produced and is currently being printed and will arrive soon. A picture below as well as a quick video explaining what is taking place has been provided to explain in greater detail what is taking place. Please keep in mind there could be occasions based on weather conditions or wear and tear on the teeing ground where tees could be moved from a damaged area and might not be exactly in the area intended. We will move them back when conditions warrant. As you can see from the score card above, 9 of the combo tees are played from the blue tee area, and 9 combos from the white tee area. Blue/White Combo tee. Each hole will have one marker that has both blue and white checker on the one marker designating it for the blue/white combo tee. It will be paired with either a white or blue marker located on the other side of the tee. How does your garden grow is a presentation taking place this Saturday by our very own horticulturist Becky Edwards. Becky does outstanding work on our grounds and will give here insight into her work at Glen Echo. She will provide you with professional advice on how to transition what she does at Glen Echo to your landscape and or patio at home. I know my bride will want me to pay close attention since I need to finish off the front landscape of our home. Sounds like its going to be a wet week with not much work being able to be accomplished outside. Come to the club and have some lunch before and a glass of wine or cocktail during the event or lunch at the end whichever you prefer. Please sign up on the club website so we can plan for proper seating for this event. Here are the weather statistics for the month of February. Above normal temperatures, less rain but greater than normal snowfall. 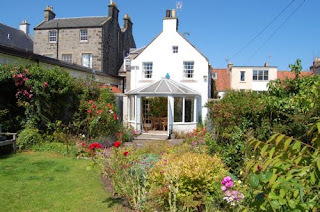 I was conversing with members the other day on twitter about trees, go figure and a lady from England came into our conversation and spoke about the Foulis childhood home being available for Letting(rental) in St. Andrews. Anyone planning a trip might want to look into this home, at least from a historical perspective. If I figured correctly, about $ 1,500 a week. The staff has been busy this past week finishing some of our approved tree management work. 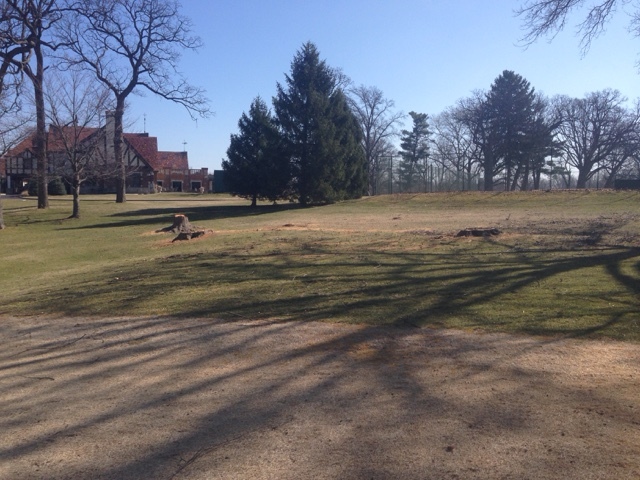 We've also been picking up a great deal of limbs, raking up sweetgum balls and other debris on the course. Becky has returned to begin work on bed clean up and other horticulture activities. Interesting information, went back to a September 2009 PowerPoint I did for the green committee and 7 of the 20 trees removed in main play areas this year were mentioned by me as trees to watch. Well, we watched them and their structure continued to worsen creating a hazard and time to remove. Two were Silver Maples near the tennis courts and one Sweetgum which was removed so that we could then replant 1 tree in an area that would allow for full, proper and mature growth instead of compromised, leggy and weakened structure. The staff were also working down along 3 fence line where some dead trees were removed near the tee area to prevent damage to the fence and protect staff and golfers from debris dropping. I also finished the remaining spraying of our fairways/tee areas for pre-emergent and non-selective weed killer to kill poa annua which has been popping up over the winter. As mentioned in the blog post yesterday, I was able to get our seed head control out before a big warm up this week and rain. Wind came up pretty fast this morning and a flat tire on the spray rig but finally got it completed. 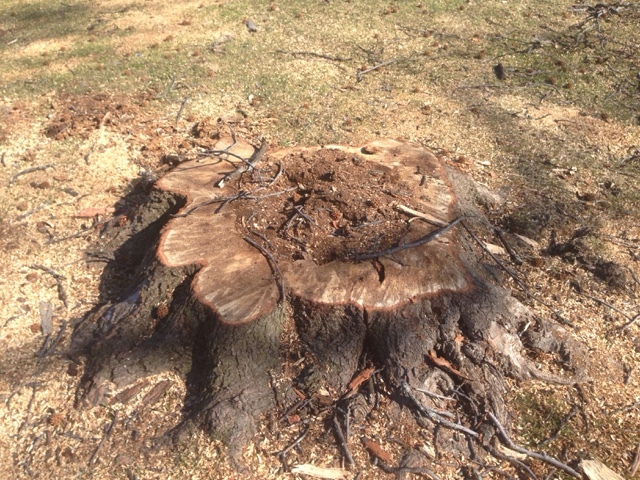 Hollowed Silver Maple that was removed. 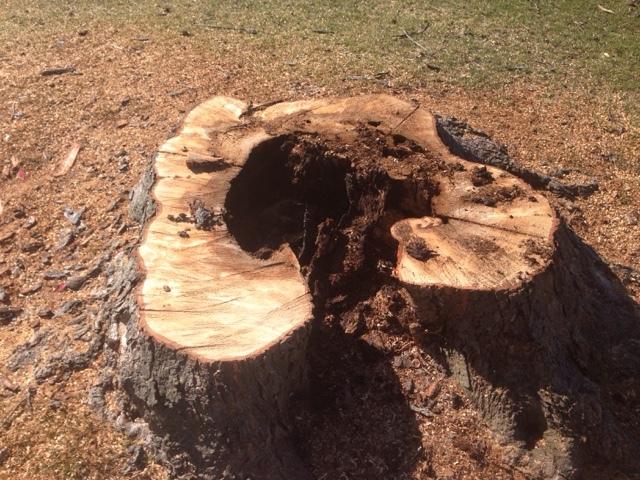 An even larger Silver Maple that was compromised even more. This Sweetgum was near the other two trees and was tall and thin and was removed to allow a new tree to be put in place of the three trees. This was the area in question along #18. We will get the stumps ground out and then place a tree somewhere in the area near the stump on the left. There are large Pin Oaks to the right which you can see the outline of limbs coming into this picture. Yes, our turf is rising from it's winter slumber, especially our poa annua. We have a variety on our practice green that wakes up a bit early. I think it awakens early because of a micro climate created by the large parking lot and roadway which is next to the green. The black asphalt absorbs heat which is then transferred onto the green artificially inflating its temperature. It is also orientated toward the west which gives it a good sun field most of the day. Interesting note, I just went out and took some soil temperatures of our greens at a 2" depth, 1:15 p.m. Practice green was 54 degrees, #11 which faces to east was 50 in the front but only 43 in the back where it is shaded by the large Pin Oak. 13 green which is facubg west was 51 degrees. At the tip of the tee is a seed head that has already developed on the practice green. Each season, we begin to count growing degree days (average heat accumulation) to determine when to apply specific products to prevent or reduce the effects of weeds, insects and fungus. Yes, scientific models are developed to help us to predict when to apply these products making them more effective. Poa annua seed head development, crabgrass control, broad leaf weeds, beetles and other pests are treated from these various models. The model we use for poa annua seed head development is the 32 degree model. Allow me a moment to explain how this model works. The high temp for Friday March 4th was 43. The low was 37 giving us an average of 40. We then subtract the 32 degree base number from the avg. temp for the day which was 40 giving us 8 growing degree days. We then accumulate the days totals until they begin to get near the target number that has been developed over the years by researchers as well as practical experience we have seen on our course. We use GDD Tracker from Michigan State University. As you can see by the map, we are getting close into the target time for applying the product. We utilize 2 growth regulators that work in combination to reduce the impacts of seed heads. The predicted outcome is about 50% control which does not seem very good but if we used no control measures, you would come to appreciate at least 50% control. We attempt to apply our product when we are trending toward 300 growing degree days. Right now we are at 221(we were at 8 growing degree days last year on this date). This week's warm up and rains should shoot us well past the 300 target mark before the end of the week. So what does this mean, yes I am either spraying later this afternoon or Sunday morning with rain predictions for most of this upcoming week. We sprayed last year around March 20th or so. We should go past that growing degree number by Thursday of this week. What does this mean for the season. Right now we are accumulating heat days about 2 weeks ahead of last year. Will it last? I don't know but we are trending for an earlier season so we will keep our fingers crossed. The weather does have a tendency to average itself out. Of course if we continue this warming trend, that creates tremendous pressure on our staff because everything is sped up, staff are not in place and those problems that come along with too much work and not enough time. Also, applications and sprays get pushed very close together which can create problems for us. Some of our chemicals don't play well together if they are sprayed to closely to one another. Greens aeration is scheduled for March 21st pulling cores and March 28 contracting a new service called Dryject. More information on this over the next couple of weeks. Received a call a few months ago regarding yours truly being a part of the Spring addition of Turf Trends Magazine superintendent spotlight. I've written a over a thousand blogs posts and published a few articles for trade publications. Pretty difficult trying to put coherent sentences together for the interviewer so the written piece makes some kind of sense to the reader. Links to the article are below. Starts on page 112.